J.M. Snyder » The Boss’s Daughter now available! 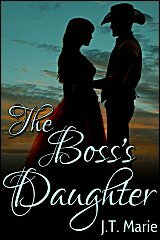 The Boss’s Daughter now available! My latest novel is a lesbian/transgender historical western called The Boss’s Daughter! Once the daughter of a prominent dentist in Philadelphia, Natalie Allen wasn’t happy with the life she was expected to lead, so she left society behind and headed west. Now, in the little town of Junction, she’s known as Nat, a cowboy working on Boss Daddy’s cattle ranch. She keeps to herself, renting a room in a local boarding house instead of staying in the bunk house, and with her dungarees and short hair, no one realizes she’s living as a man. But Boss Daddy’s pretty daughter Miss Lucille takes a notice to “Mr. Nat,” and the closer the two become, the more conflicted Nat grows. She likes Miss Lucille a lot more than she knows she should, and it’s easy to forget who she’s pretending to be around the boss’s daughter. Then Miss Lucille surprises everyone, Nat included, by announcing their engagement. Nat knows they can’t marry, and if she tells Miss Lucille why, her ruse will be up. Her only choice is to leave Junction behind, even if it means breaking Miss Lucille’s heart. But will Miss Lucille let Nat go so easily?